Has Nvidia's first graphics card with GDDR6 memory shown itself? It’s definitely a prototype, but is it Nvidia Turing? While we can’t be certain exactly which, Nvidia is clearly hard at work on its next-generation graphics card, judging by a recent Reddit post. Since deleted, the post shared a photo of what appears to be a prototype printed circuit board (PCB) for a graphics card using the next-gen GDDR6 video memory. 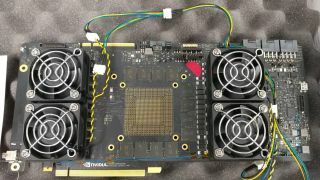 Scooped up by VideoCardz, the website notes that this supposed leak post – which was not only deleted, but its author’s account was also erased – could very well be what many expect to be Nvidia’s next gaming-focused graphics architecture, Turing. However, it’s entirely possible that the PCB shown could be that of an upcoming Quadro or Tesla processor; either of which would likely use the latest GDDR6 video memory regardless. The reason for this uncertainty is two-fold. First, this is clearly an early version of a graphics card PCB, with its many elements far more spaced out whereas a final product would be much more compact. Second, there is no actual graphics processor, or GPU, found on the board. Of course, the presence of the GPU would be a dead giveaway for exactly the type of card it is, likely emblazoned on its metal surface. Instead, all we see are three 8-pin power connectors and 12 modules of memory maker Micron’s latest GDDR6 video RAM surrounding the area where the processor die would sit. In short, assuming this is even the real deal, there are still far too many unknowns to simply peg this as the rumored Nvidia GTX 1180 in development. This PCB could very well be a testbed for any of Nvidia’s upcoming GDDR6 products. At any rate, take this as a sign that Nvidia is likely hard at work on getting cards with GDDR6 video memory on the shelves.